Oil on panel, 36,5 x 48 cm. Despite the grey weather, this is a romantic idealised river landscape. The water is still and the fisher is puttering about in his boat. The dramatic cloud formations are depicted in varying grey nuances, flashes of light break the monotony and indicate that although the sky is a physical phenomenon, for the artist, it is above all the site of God and of poetry. Sails, tower spires and trees stretch towards the sky. 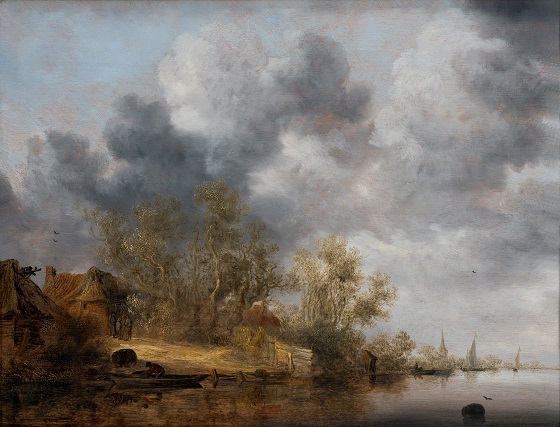 The low horizon and the discretely placed figures are typical of Dutch landscape painting around 1650, where atmosphere was often more important than action. The colouration is refined, transitioning from the earthly tones of the foreground to the greens of the middle ground and finally to the distant grey-blue nuances of the background.